Hupmobile was an automobile built from 1909 through 1939 by the Hupp Motor Car Company, which was located at 345 Bellevue Avenue in Detroit, Michigan. Its first car, the Model 20, was introduced to the public at the Detroit Auto Show in February 1909. The company initially produced 500 vehicles. Robert Craig Frost (June 2, 1877 in Grand Rapids, Michigan – 1931), a former employee of Oldsmobile and Ford, founded the company with his brother Louis Gorham Hupp (November 13, 1872 in Michigan – December 10, 1961 in Michigan) in 1908. Production began in 1909. In 1910, production increased by more than 5000. Following disagreements with his financial backers Robert Hupp sold his stock in the Hupp Motor Car Company and established the short-lived RCH Automobile Company, later the Hupp-Yeats Electric Car Company. In 1912, Hupp would be one of two automakers pioneering the use of all-steel bodies, joining BSA in the UK. Hupp's panels were produced by Hale & Kilburn, which was run by Edward Budd. Carl Wickman, a car dealer in Hibbing, Minnesota, used an unsold 7-passenger model as the first vehicle for what became Greyhound. In 1913 Frank E. Watts was hired as a designer. Hupp Motor Car Company continued to grow after its founder left. A new plant was purchased in 1924, at the corner of Milwaukee and Mt. Elliott in Detroit, as Hupp competed strongly against Ford and Chevrolet. DuBois Young became company president in 1924 moving up from vice-president of manufacturing. By 1928 sales had reached over 65,000 units. To increase production and handle the growth in sales, Hupp purchased the Chandler-Cleveland Motors Corporation (Chandler Motor Car) for its manufacturing facilities. Sales and production began to fall even before the onset of the depression in 1930. 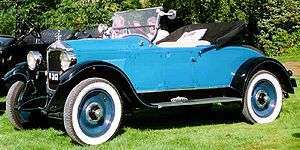 A strategy to make the Hupmobile a larger, more expensive car began with the 1925 introduction of an 8-cylinder model, followed by the complete discontinuance of the traditional 4-cylinder Hupmobile after 1925. (Hupmobile had made only 4-cylinder cars from 1909 to 1924). While aiming for a seemingly more lucrative market segment, Hupp essentially turned its back on its established clientele. The company made the same mistake that many other medium-priced carmakers were making at the same time. In an attempt to capture every possible sale, they offered many different models. With Hupmobile's relatively low production volume, the result was that no model could be produced in sufficient quantity to keep manufacturing costs low enough to provide an operating profit. Hupp abandoned its more conservatively styled product line and turned to industrial designer Raymond Loewy to design its 1932 Hupp cyclefender, a flashy roadster that did well at the track, but sales continued to decline. 1934 saw the introduction of a striking restyle called the "Aerodynamic" by Loewy, as well as the lower-priced series 417-W using Murray-built slightly-modified Ford bodies. Despite technical innovations, squabbles among stockholders and an attempted hostile takeover in 1935 took their toll on the company. By 1936 the company was forced to sell some of its plants and assets and in 1937 Hupmobile suspended manufacturing. A new line of six- and eight-cylinder cars was fielded for 1938, but by this time Hupp had very few dealers, and sales were disappointingly low. 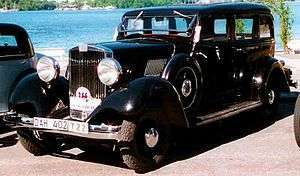 Desperate for a return to market strength, on February 8, 1938, Hupmobile acquired the production dies of the Gordon Buehrig designed Cord 810/812 from the defunct Cord Automobile Company. Hupp paid US$900,000 for the tooling. Hupmobile hoped that using the striking Cord design in a lower-priced conventional car, called the Skylark, would return the company to financial health. Enthusiastic orders came in by the thousands, but production delays soured customer support. Lacking adequate production facilities, Hupmobile worked out a deal with the ailing Graham-Paige Motor Co. to share the Cord dies. Hupmobile and Graham would both sell similar models, which would all be built at Graham-Paige's facilities. While each marque's product used its own power train, the Graham edition, called the Hollywood, otherwise differed from the Skylark in only a few minor details. In 1939 the Hupmobile Skylark finally began delivery. Unfortunately, it had taken too many years to produce and most of the orders had been canceled. Production lasted only a couple of months, and only 319 Skylarks were produced. 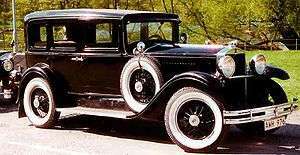 Hupmobile ceased production in late summer. Graham-Paige suspended production shortly after the last Hupmobile rolled off the line. In a constant effort to remain competitive, Hupp introduced a number of new features. They were one of the very first automakers to equip their cars with "free wheeling," a device that enjoyed immense, but brief, popularity in automobiles in the 1930s. Hupmobile also pioneered fresh-air car heaters with the Evanair-Conditioner. In 1914, Eric Wickman tried to establish a Hupmobile dealership but couldn't sell them so he started transporting miners in one of the vehicles and founded Greyhound Lines. The National Football League was created at Ralph Hay's Hupmobile dealership in Canton, Ohio in 1920. The Skylark's grille later inspired the grilles used on Lincoln Continental models in the 1940s. Their heater technology became widely adopted in the industry. The Hupmobile dealership in Omaha, Nebraska is a prominent historic landmark. The dealership building in Washington, D.C. is now the H Street Playhouse. Wikimedia Commons has media related to Hupmobile vehicles. ↑ Csere, Csaba (January 1988). "10 Best Engineering Breakthroughs". Car and Driver. 33 (7). , p. 63. 1 2 Lewis, Mary Beth. "Ten Best First Facts", in Car and Driver, 1/88, p.92. ↑ Connersville Chamber of Commerce Retrieved 4 May 2015. ↑ "The Endangered List," Landmark News. April 2007. Retrieved 5/12/08. "Advertising: Hupmobile Runabout - $750". The Outing Magazine. LVIII. April–September 1911. Retrieved 2009-08-16.